But is there really such a thing as "unwanted" candy? When did all the brands become so selfish? Besmirching the candy of other brands!? For shame, Reese’s! Still, I can’t deny that I would rather eat a Reese’s Peanut Butter Cup over like– any other type of candy. Maybe not over an apple. Unpopular opinion, I know, but I’ve got to digest all this stuff, right!? In any case, Reese’s, that lovable brand that mixed your chocolate with their peanut butter for a hyperbolically good result, has installed a “Reese’s Candy Converter” on 5th Avenue in New York to let all the trick or treaters out on the town today, wearing their no doubt ironic “all life on Earth is melting into a nub” costume. The idea is you put in candy you don’t want and Reese’s gives you something they assume you do want — a Reese’s Peanut Butter Cup. And unless you’re allergic to peanut butter or are a literal dog who cannot eat chocolate, they’re probably right. You DO want a Peanut Butter Cup. They’re just GOOD okay. I have two questions though. First off, you’re installing this thing on Fifth Avenue in New York? The rich guy district in a massive city known for its worst Wall Street rich guys? I don’t know if the candy is going to be that bad over there, you know? Then again these guys are cruel and cheap as hell. Maybe they gave the kids rocks and then the rocks break the Reese’s machine when they put them in there. The other thing is– what is the Reese’s machine doing with all the candy? Is it just sitting there? Is it going to be donated to some very annoyed people? Is one man going to eat it? The terrifying candy eating man? Top hat, jaunty limbs. Devouring them through his skeleton crooked teeth. And when he is done with Candy-Flesh he turns to you and cruses you for robbing him of that sweet Reese’s Peanut Butter taste. You run but you are no match against the athletic sprint of his skeletal legs. Scream all you want. Reese’s can’t help you now. 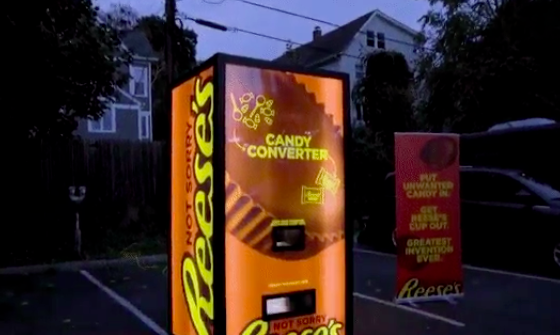 What do you think of the Reese’s Machine? Let us know in the comments or on Twitter at @WhatsTrending.